by new or used artists. Contact Wendy. 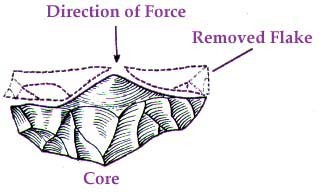 A core is struck by a hammerstone and a flake falls off. The toolmaker may use the shaped core, in which case it is called a core tool. Or the flakes may be used to cut with. 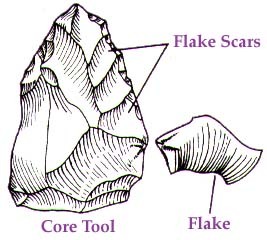 These are called flake tools. This method creates blade tools. By applying pressure in one direction with another rock, a long, thin flake is removed. This type of flake is called a blade. Our dinner table knife and fork are part of a long chain begun by our distant ancestors, the prehistoric humans, two-and-a-half million years ago. Making your own stone tools, or "flintknapping," is very difficult and it takes a lot of practice. It's fun, but it can be dangerous. When you strike two stones together, very sharp pieces can fly off and hurt you. Those who want to learn how to stone tools should seek the supervision of a skilled flintknapper.